Restoration work at the Race Track Nature Preserve has been made possible by the generous donations of the Founding Stewards, Meadow Stewards, and Tree Stewards, residents who care about conserving the environmental health, biodiversity and rustic beauty of our Village to benefit generations to come. The Stewards are acknowledged on bronze plaques at the Preserve. The Race Track Nature Preserve is a tangible legacy you can pass to your children and grandchildren. Your donation to a public cause is tax deductible. IMPORTANT SAFETY TIPS when visiting the Race Track Nature Preserve. Read more. Each resident of Tuxedo Park is responsible for the stewardship of the natural resources of the Race Track Nature Preserve. By doing so, we ensure the Preserve remains a place where we can have the unique experience and pleasure of being surrounded by nature. We need to protect the native wildlife and flora, and conserve the distinctive habitats identified by environmentalist Spider Barbour: different types of meadows; swamp, marsh and seasonal wetland; and forest. We must strive to produce long-term benefits to wildlife and promote native biodiversity, in accordance with sound and generally-accepted soil and water conservation methods. and generally not to disturb any components of the natural landscape (not even the rocks). Thank you for being stewards of the Race Track Nature Preserve. The TPTAB is thrilled to announce that, with the consent of the Board of Trustees and encouragement of the NYS Department of Environmental Conservation (DEC), we are transforming the 21-acre Race Track into a Nature Preserve! Click here to read about the Race Track Nature Preserve Dedication Ceremony on October 23, 2016. This will be a multi-year community project funded entirely by private donations and government grants. What will the Preserve look like? 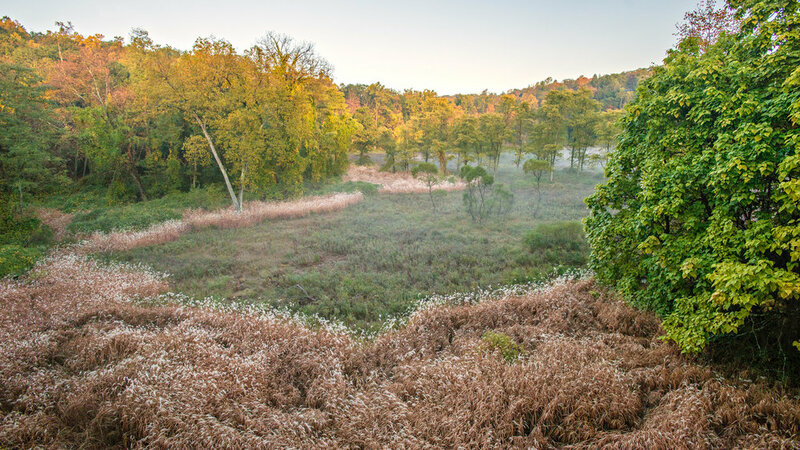 Larry Weaner Landscape Associates have been chosen by an open bid process to design the master plan for the Nature Preserve. They will begin work in October. Weather permitting, we hope to have the bulk of the plan by spring 2017. Implementation – which involves staged removal of invasive vegetation, replanting with native species and ongoing maintenance – will follow. The restoration work will span multiple years, phased to match donations and government grants. The aesthetic vision calls for a wide meadow of native flowers and grasses blooming from spring to autumn at the center of the bowl-shaped depression. The perimeter slopes and uplands will be forested by majestic mature trees and a healthy understory of young trees and native shrubs. Walking paths, viewing points, and historical and botanical plaques will offer enjoyment to residents as well as educational opportunities for local school children. The Nature Preserve will also provide invigorated habitats for the wide array of flora and fauna which already live there or use it during migration. This enhanced view corridor will emphasize the signature forest-setting character of our Village and delight the senses of residents and visitors alike. We have already started preliminary work under the advice of Trillium Invasive Species Management Inc., to remove invasive plants along the embankment areas bordering Tuxedo Road and Clubhouse Road, including Phragmites, Japanese Knotweed, Japanese Angelica Tree, Japanese Stiltgrass, Goutweed and Miscanthus that are depriving native vegetation of soil, nutrients, water and sunlight. This removal phase will be followed by replanting activities spanning several years directed by Larry Weaner Landscape Associates, and a maintenance program thereafter. An open bid process started earlier this year guided the selection of these professional services firms. Race Track Nature Preserve: why is it important for you? Have zero impact on your taxes. It will be funded entirely by donations and government grants. A tangible legacy you can pass onto your children and grandchildren. Provide a beautiful serene place for your family’s enjoyment. Positively impact the Village’s natural environment. Facilitate storm water management for the surrounding hills, roads and properties. Reinforce the structural integrity of Tuxedo Road and Clubhouse Road embankments. Improve the quality of our air and quality of the water that feeds into the Ramapo River, a source of drinking water for millions in New York and New Jersey. Provide Tuxedo Road with a stunning natural vista that epitomizes the picturesque lifestyle of our community. Help raise our real estate value. The Race Track was the site of the Tuxedo Park Horse Show during the Gilded Age. Abandoned since the 1940s, nature has claimed it as a biodiverse sanctuary: more than 300 trees and plants have been identified by naturalist John Yrizarry, environmental consultant J.G. Barbour and Bowman Hill Wildflower Preserve. Some 200 species of bird nest there or use as a flyway, while countless mammals, reptiles, amphibians and butterflies call it home. This level of biodiversity is rare in the Lower Hudson Valley. The Race Track is also a very cost-effective storm water management system for the surrounding hills and properties, without which the Village, at tax payers’ cost, would have to put in place an expensive man-made system. Water draining from the surrounding hills has also created wetlands that feed into Augusta Brook, a tributary of Ramapo River which provides drinking water to millions in NY and NJ. Moreover, the trees and shrubs along the Tuxedo Road and Clubhouse Road embankments are instrumental in providing structural support to these much traveled public roads. For these reasons, the Race Track is not suitable for development. But it presents a wonderful opportunity for the area to be transformed into a well-maintained, scenic nature preserve for the enjoyment of the community. Pierre Lorillard IV founded a rustic retreat to revitalize the body, mind and soul. As environmental stewards, we are privileged to honor and to continue his legacy.